resistant to bolting. Performs well under glass or polytunnel. If you Sow one seed per module about 1cm deep and about 4 – 5 weeks later plant out. Florence fennel is a Mediterranean vegetable so it will thrive in the summer heat of your tunnel or greenhouse. 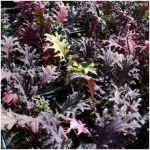 It is one of the most attractive vegetables with its decorative feathery foliage and the white bulb just above ground level. I am often surprised why garden designers never use Florence fennel in their flower borders. 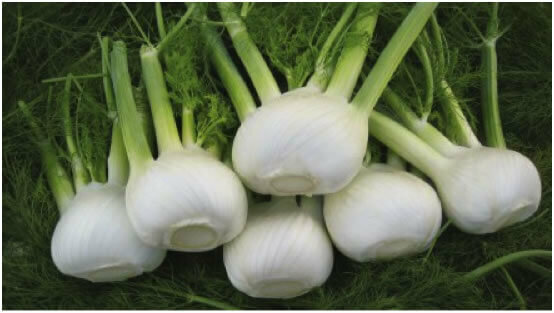 It is also a delicious vegetable with a lovely texture and fresh taste – a hint of aniseed and celery. Apparently the Greeks and Romans ate it in order to ward off obesity. Florence fennel grows well on any fertile, free-draining and moisture-retentive soil with well – decomposed compost dug into it. The ideal pH is 6.0 – 7.0. It should be grown in full sun with no shading effect from neighbouring crops. Fennel dislikes root disturbance, so it should be sown directly into modular trays (1 seed per module) about 1cm deep. The trays should be placed on a heating bench at 20ºC. In order to get continuity sow only small amounts every three weeks from early May until late July. Ensure that you use a bolt resistant variety for the early sowings in May. Plant out modules about four to five weeks after sowing. Do not plant them deeper than they are in the modules. A spacing of 35 x 35cm will give you decent sized bulbs. 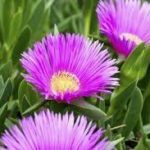 Keep the beds well hoed and weeded and water the plants at least twice a week. The bulbs should be ready to harvest about 3 to 4 months after sowing. Cut the stalk below the bulb at ground level. It is best to trim off all the leaves. They can be used for flavouring and stock. If the leaves remain on the harvested bulb they draw out the moisture and the bulb will become soft. It is best to harvest Florence fennel as you require it in the kitchen. The bulbs may last for a few days if left in a plastic bag in the fridge. Slugs like the young plants and aphids feed on the leaves during warm dry weather. If carrot root fly is a serious problem in your garden it may also affect fennel. The most difficult problem, however, is bolting. This happens especially if there is a period of cold weather after planting and also during dry spells. 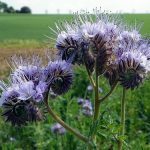 To reduce the risk of bolting you could delay the first sowing until early June, water regularly and use a bolt resistant variety for early sowings. You will get 9 bulbs per square metre.